How will southern independence affect Sudan? Image caption Sudan is being prepared for losing its status as "Africa's biggest country"
Southern Sudan's independence will create in effect not one but two new states. The new-born Republic of South Sudan will face many challenges - but Sudan will be in an equally vulnerable position. Khartoum will have to cope without the south's oil reserves, and deal with continuing fighting in Darfur, as well as fresh conflicts in Southern Kordofan and perhaps elsewhere. More than that, Sudan's identity is being hotly debated - and a worried outside world is watching. Southern secession will strike a blow to the pride of people who until now have delighted in extolling "Africa's biggest country" - and to President Omar al-Bashir, who will preside over the schism. His officials, like National Congress Party spokesman Ibrahim Ghandour, insist the head of state's stature has grown since he brought an end to the north-south civil war. Mr Ghandour believes South Sudan represents Khartoum's greatest headache, and tense relations with the former subjects seem inevitable. But he does accept Sudan is in for a difficult time - even if he denies that his party is to blame. "In Sudan there are problems but it is partially created by foreign interventions, and some of our countrymen are getting involved in conflicts because they are interested in power," he says. Nevertheless the uppercut to the country's economy is undoubtedly of great concern. In the past decade or so, Khartoum has undergone an oil-fuelled building boom, but about three-quarters of the oil is in the south. Under the terms of a 2005 peace deal, Khartoum and Juba have been sharing the income from the southern oil equally. Northern economists calculate they will now face a 36% gap in their budget. Some of that will be replaced when a deal is signed specifying how much South Sudan will pay for using the north's pipelines, refineries and export terminal. Mr Ghandour and other northern officials hope a renewed focus on agriculture and increased revenues from mining, and in particular gold, can make up the rest. But with southern independence imminent, the Sudanese pound is already slipping against the dollar, foreign currency reserves are depleted - and all this is being felt in local food markets, where prices are rising. "Two months ago everything was cheap, now there is a great increase. Meat used to be 12 pounds [about $4.50, £3], now it is 20, and sugar has doubled," says Mohamed, doing his shopping in Omdurman, Khartoum's twin city just across the River Nile. "We are complaining about these high prices." That raises a familiar spectre of the depleted banquet - the sort of demonstrations that have twice brought down Sudanese heads of state. "This is typical of what happened in October 1964 and April 1985," says Haj Hamad, an economist who runs the Social and Human Development Consultative Group. "You touch the untouchable which is the food basket, and usually in Sudan you have housewives banging pots in the middle of the night, when the security is sleeping, then you will have a government change." Sudanese officials rubbish such claims, saying the fundamentals of the economy are strong. But there has to be some concern, particularly if new oil isn't found to complement the limited existing northern reserves, or world prices tumble. 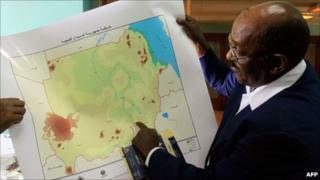 Sudan will try to have its colossal debt - about $39bn (£24bn) - written off, and get US sanctions removed. But this depends on Khartoum's difficult current relationship with the West improving dramatically. That will only happen if Khartoum changes the way it deals with areas of the north that reject its policies. "We need to ask: 'How is the north going to be ruled,''' Yassir Arman, the secretary general of SPLM-North, the northern wing of the rebels which gained the south's independence, told the BBC. "This is how we can avoid the experience of the past." South Kordofan is the latest part of a vast country to descend into violence. Clashes between the Nuba people, who largely support SPLM-North, and the Sudanese armed forces have been going on for a month. Church groups have talked of "ethnic cleansing" of the Nuba, and US President Barack Obama has expressed his concern at the reports of attacks based on ethnicity. SPLM-North leader Malik Agar has warned that fighting in South Kordofan could spread to his area, Blue Nile state, and elsewhere. The civil war in Darfur, which broke out in 2003, is still not resolved. The government hopes to sign a deal with one rebel force, the Liberty and Justice Movement, sometime in July. But the LJM is not strong militarily. The rebels who count on the ground, forces lead by Abdel Wahid Mohamed el-Nur, Minni Minnawi and Khalil Ibrahim, are either not negotiating or are unlikely to sign the agreement. Fighting flares up periodically, and vast areas of the remote region are extremely dangerous. Most experts believe there will never be a solution to Darfur's problems until underlying issues of development and power relations are resolved. President Bashir is wanted by the International Criminal Court for alleged genocide committed in Darfur, which means the Western world ostracises him. The president, who has been in office since taking power in a coup in 1989, has said he will step down before the next elections, but not everyone is convinced. For the moment, he has already signalled his intention to move back to a pure form of Sharia or Islamic law. In the 1990s Khartoum hosted Osama Bin Laden, and a return to radicalism is the great fear of the West - and that of many Sudanese. "They are trying to move back to a more radical way, but they won't be able to do it," says Hafiz Mohamed of Justice Africa, a campaigning group. "They are in a weaker position. In the 1990s they were able to rally people behind jihadism, but people are tired of war." All the same, an external threat - whether it is northern rebels, the old foes in South Sudan, foreign intervention, or "enemies of Islam" - could well be used to unite Sudan during what will be a very tough period. But ultimately the lessons of South Sudan and Darfur are likely to hold true, whoever is in power. If large areas of the country continue to feel marginalised, Sudan will never be at peace.